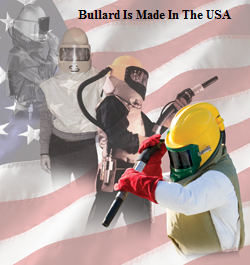 The Bullard® GENVX2830® Respirator With Standard 28" Nylon Cape, F30 1/4" Constant Flow Valve, Belt, Breathing Tube & Adjustable Ratchet Suspension Is Lightweight In Construction, Cool & Offers Superior Comfort. 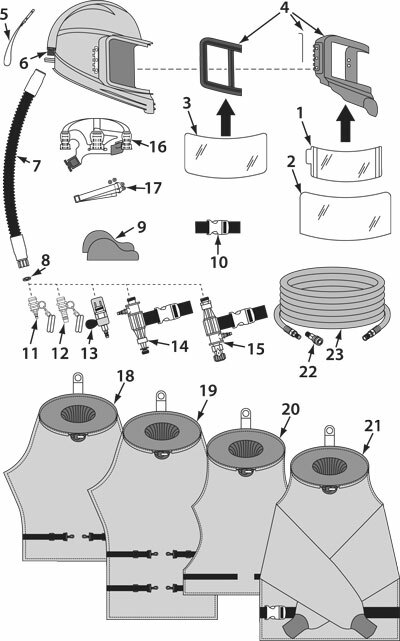 Assembly is included with helmet, breathing tube, cape, Hansen compatible flow control device, belt and mylar lens covers. 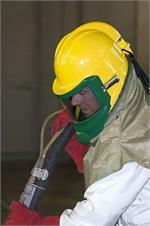 Helmet is constructed using high-density polyethylene material for extra strength. It is featured with removable cheek pads for added convenience. It has an integrated airflow tunnel that surrounds your head for good cool air circulation. It is built such that the air directly flows over the head offering most cooling options. 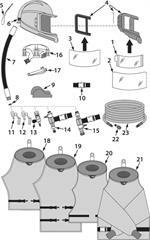 The helmet features a center breathing tube connection & has a six-point suspension with 1" wide straps. Viewing area measures 4" X 9 3/4" to offer good visibility. It is provided with "Grit Guard" visor and injection-molded door that establishes a tight seal. It offers high impact face protection as per ANSI/ISEA Z87.1-2009, type I, Class C. Helmet is provided with latch guard that keeps cap secure. 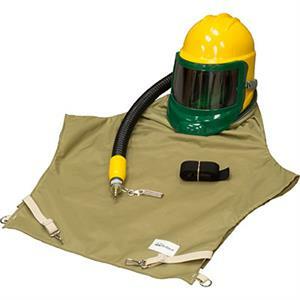 The Bullard GenVX Series airline respirators are approved by NIOSH (TC-19C-0489, TC-19C-0491, TC-19C-0492, TC-19C-0493, TC-19C-0494, TC-19C-0495, TC-19C-0496, TC-19C-0498, Type C and CE) to provide respiratory protection in general purpose applications including heavy- and light-duty abrasive blasting, and Type C and CE painting applications. 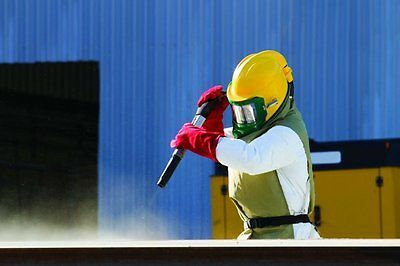 The protective helmet meets ANSI/ISEA Standard Z89.1-2009 Type 1 requirements for protective headwear for industrial workers, and ANSI/ISEA standard Z87.1-2010, Z87+ High-Impact Face Protection. Weighing a pound less than the leading competitor and coupled with a 45° cool tube and cheek pads, the GenVX™ is the lightest, coolest, most comfortable and most dependable helmet on the market.